What's better than a perfect summer cocktail? A healthy summer cocktail of course! Fresh young Thai coconut is a delicious treat, with the coconut water supplying natural electrolytes to help us replace fluids, salts and minerals lost during the heat of summer – especially after an intense day of exercise or time in the sun. Coconut water is very high in potassium, low in sugars, has a modest amount of sodium and a light, nutty flavor. 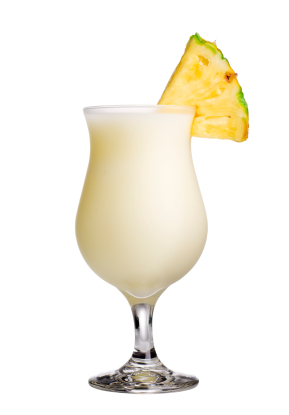 Blended with the young flesh, it makes a deliciously creamy drink for summer. The coconut flesh is rich in protein, fiber and medium chain fatty acids, including lauric acid which is naturally antiviral and antifungal, helping to prevent yeast overgrowth, and supplies a quickly digested source of energy for an improved metabolic burn. Fresh lime juice supplies Vitamin C, and using maple syrup as a natural sweetener provides B-vitamins and minerals. Pineapple is of course a delicious and nutrient-packed fruit, high in the antioxident Vitamin C and the mineral manganese. The core of a pineapple contains the enzyme called bromelain, a natural anti-inflammatory enzyme which contributes to healthy joints and can ease symptoms of arthritis by reducing inflammation. Smoothies (or coladas!) are a great way to use the tougher core that is sometimes less desirable to munch. I love it when there is a great reason to make a summer drink! Before whipping up your frosty summer cooler, learn how to open a young Thai coconut, by watching this video. *organic pineapple is also available frozen in natural food stores and co-op groceries - making this even easier!